I like to feed Nehal healthy desserts made from nutrition rich ingredients rather than a fat-rich cake or mithai. 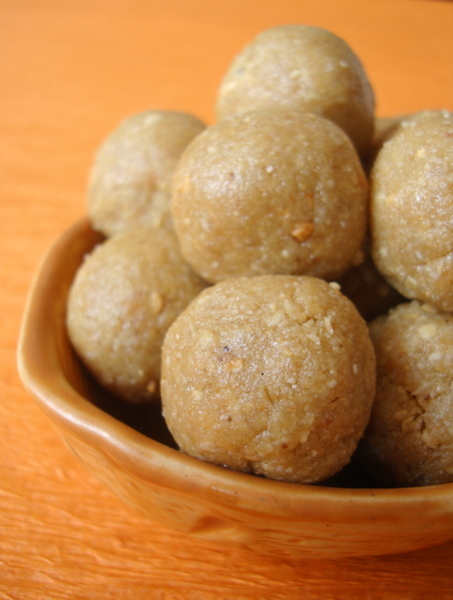 Sesame seeds Laddu falls under the category of a healthy dessert. 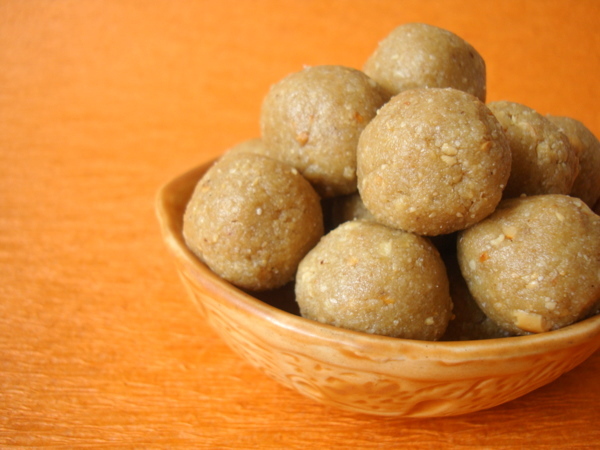 Nuvvula Unda or Nuvvula Laddu is a classic Andhra style sweet prepared for festivals like Nagula Chavati. At home, we make this calcium rich sweet often. I usually make small laddus (compared to the size of the sesame seeds laddus you see in this post) and serve as an after lunch dessert to Nehal. Very simple to prepare with only two ingredients going into the making of traditional Nuvvula Laddu recipe. I tend to add roasted almond meal or roasted and powdered oats to boost the nutritional profile. The taste of Nuvvula Unda will depend on the quality of jaggery and sesame seeds. Use fresh sesame seeds and good quality jaggery to enjoy the chewy nutty taste of sesame seeds and the sweet flavor of jaggery. A unique combination of flavors that is bound to get you addicted. 1 Dry roast sesame seeds in a heavy bottomed vessel till the rawness disappears and a nutty aroma emanates the kitchen. Roast on low flame and do not burn them. Remove onto a wide plate and allow to cool. 2 In the same vessel, add the oats and dry roast on low flame for 5 mts. Remove onto a plate and cool. 3 In the same vessel, add the almonds and dry roast on low flame for 5 mts. Remove onto a plate and cool. 4 First grind the almonds till coarse. Remove onto a bowl. Next grind the oats to a powder (5 seconds). Remove onto a bowl with almond powder. 5 Next blend the sesame seeds for 5-6 seconds. You have to make a coarse powder of the sesame seeds. Add the grated jaggery and blend till combined. Add 1-2 tbsps of milk and blend. You can see the oil (sesame seeds) oozing out of the mixture. 6 Remove onto a plate and add the oats powder and almonds powder. Mix and make small balls with this mixture. 7 Store in an air tight container and they stay good for a week to ten days. You can store in the fridge too for longer shelf life. Cardamom powder is an optional ingredient and I usually do not add it. If you are not using oats, reduce the quantity of jaggery by 1/4 cup. You can add 1/4 cup of desiccated coconut for variation. hi sailu, i am going to definitely try this i am allergic to oats/wheat what can be the alternative to it. Omit oats and use desiccated coconut in its place for this recipe. hi sailu, i have tried this today without oats and have added dry coconut and walnuts too.. it really came out very tasty.. thank you so much for the wonderful post once again. whatever recipes you post it never fails so i try ur new recipes closing my eyes confidently every time. This is my favourite sweet in winters…. Thank you so much for posting this recipie. I have tried most of your recipies and they come out really well. Will definitely try and feed my 3 year old daughter. Is it really as simple as that? Thank you for the recipe…I have been thinking of a variety of things to do with the big pack of sesame seeds in my pantry. On to putting them to use in til ke laddu! Its my favourite sweet, and am really missing here in melbourne. Ur post has given me an inspiration to try this. My fav anytime,feel like gobbing some. One of my Christmas treats to make.. Thank you for this healthy ladoo version.. I hope my picky kids like them..
Can pregnant women also can have this laddu once a while…. i think pregnant women can have this. I had it many times when i was pregnant with my daughter (now 2 years old). We believe that til+cocnut gives great skin and Thats proved true.so we consume it from 5th month. i made this n it came out very well…kudos to you Sailu. hi sailu have tried this recipe. it turned out awesome and my stock of sesame is over now after long time:) thanks to you. I have almonds at home. can i use the same method to prepare almond ladoo. shall i soak almond or just roasting is fine ? let me know. looking for some good recipe. if you can advice something pls. I tried this recipie.it came out very well.Thankyou so much for healthy recipie. hello sailu, this makar sankrathi i tried your laddu recipe and it comes really very delicious. my guests like it . thank you. I just made this today and was an instant hit with the the family! 🙂 Thank you much for sharing this recipe. It was turning out to be awesome until I added the milk. Tht made it a gooy mess. Now I have no clue how to rescue it but atleast I know where to stop next time. Thanks for this super healthy recipe.